The Gault&Millau guide just launched in Romania, providing gastronomy lovers with an overview of the restaurant scene in Bucharest, Cluj, Timisoara, Brasov and other cities. It took five months and around 350 visits to more than 200 restaurants to handpick the 141 best restaurants in Romania, which obtained a score of 10 points or above. Come de Cherisey, CEO of Gault&Millau and Alexandre Almajeanu, founder of Gault&Millau Romania, broke down the methodology and praised the rise of the local restaurant scene riding a wave of momentum brought to local gastronomy by the emergence of young chefs. Why did you enter the Romanian market now? Come de Cherisey: We are looking for countries that have two main elements: potential for tourism and potential for business. When you have those two elements at the same time, there is potential for gastronomy. Then, we are looking for countries that are aware that agriculture is deeply linked to the culture, which is deeply liked by the tourism potential. So it’s time for Romania now. 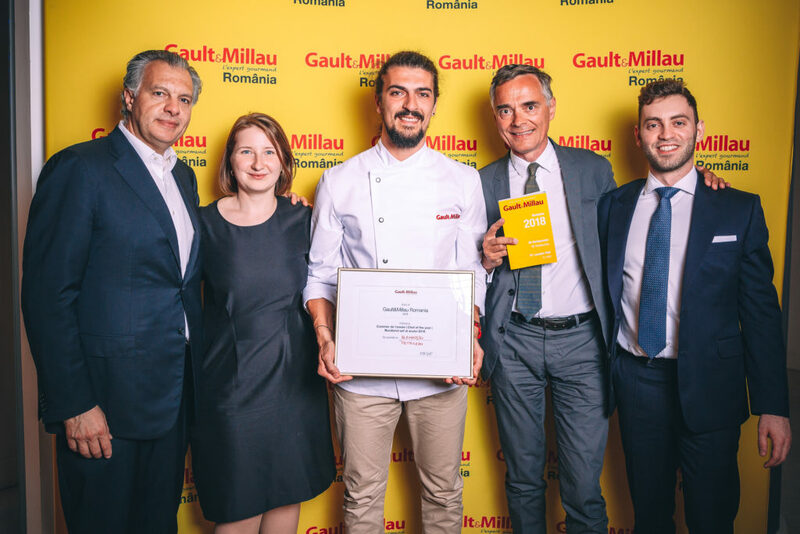 Alexandre Almajeanu: When I had the discussion with Come about the expansion of Gault&Millau, of course, I immediately told him about Romania. A lot of things are happening in Romania right now. I knew that the restaurants and Horeca Market in Romania was booming. So I told him there are definitely a lot of things to do in Romania. He came last year and of course, there were a lot of discussions about the market. We have very young chefs emerging right now. The media helped a lot with this in making them well known, I believe. So the next step was arriving now with the guide and focusing not only on the ten famous chefs you see on TV, but to take the chefs out of the kitchen and to show who they are. How would you describe the Romanian restaurant scene? CC: The restaurant scene is moving very fast. You have very young chefs and you have plenty of opportunities. Because this combination between the awareness of good products and the awareness of the expectations of the public is very interesting. And the public is expecting new things right now. Because the new chefs are appearing on TV and there is the economic growth as well as political stability. It seems like the things are changing now. AA: It’s quite interesting. The fact that all the chefs are very young means that you don’t have something you find in France – something that can be described as the weight of the past. So in Romania right now they can be very creative and can go beyond a certain aspect of the Romanian mentality – which says ‘do not innovate too much, do not be the one to do things too differently’. From what I see in the kitchen, they are not shy. They try everything, they have no complexes, so it is very, very interesting. You talk a lot about the young chefs emerging. Why are they an important factor for the Romanian restaurant scene? CC: Traditionally, chefs start their professional lives very young. They can start as young as 15. Their first studies are in the kitchen. That is why, when chefs are 20 years old, they already have experience. That is quite different from anyone else. So, as a chef, you are a real professional at 20 or 22. And know what you want and you are able to say it. You know your goals. And in a country with new gastronomy, you do not have old chefs. It’s the way it is. AA: That was even funny for us when we made the Gault&Millau prizes and were considering the concept of ‘young chef.’ Chefs are usually from 20 to 70 years old. In Romania, however, chefs are aged between twenty-something to 30, 35. So in Romania, the ‘The Chef of the year’ could be even younger than the ‘Young Chef of the year’ and ‘The Chef of the year’! CC: What I am wondering about the long-term is how the relationship between Romanian chefs and the Romanian chef working abroad in restaurants in England, in Italy, Canada and elsewhere will look. If they return to the country, that could be very interesting for the local restaurant scene. Please talk us through the process of assessing and classifying a restaurant. Also, who can be a tester for Gault&Millau? CC: We have an international method which comes from the founders Henri Gault and Christian Millau and was set 45 years ago. The Gault&Millau values are based on this method. We deeply respect the chef and we want to have a fair ranking. We have grades and we have testers. In all countries where we are we use the same, it’s international. This ensures our objectivity. We have a 40-point system that starts assessing a restaurant from the moment you step into the moment you leave. We evaluate the noise, the smell, the space between the tables. How long will I wait before being brought the menu? How big is the menu? If you have a 25-page menu it is not good, because it means a lot of the dishes must be made from frozen ingredients. If you have a one page menu, this is a good thing because it means it should be fresh and local products. Also, are the products local? Our testers look at all of that. They are 100 per cent anonymous and they pay the bill. They do not have a visitor’s card. And they are experts of taste. This is very important, that they have a huge experience. Because, ‘what is taste?’ Taste is memory. If you don’t remember all the flavours of what you ate as a child at your grandmother’s, if you don’t remember all the flavours of all local products, and the terroir, or if you don’t know the flavour of ingredients from local products in Romania’s countryside, you can’t be a tester. We employ people who are very deontological, who want to keep the secret of their job. And who are just open-minded to new experiences and who are willing to travel and understand what it gastronomy means in other countries where we are present. After they come up with the grade, we have a committee that reads the grade and look at the pictures and deliberates. And then we can write down the text. Then we will fly over three international testers that will challenge what the local testers have submitted. We believe this is highly important, as it is a great responsibility: we can bring them business or not. We can bring them fame or not. For us, it is a huge responsibility. Which Romanian restaurant received the highest score and why? Which CEE country did you enter first and when? CC: We’ve been in Poland and in Hungary for five years now. And we entered Croatia, and we will soon enter the Czech Republic and Slovakia. We want to be in all the CEE countries where you have potential and business now. You have 600 million tourists in Europe 1.2 billion tourists in the world and it is going up by 10 per cent every year and if a country doesn’t put its gastronomy first it doesn’t work. AA: Generally, the entrance of the Gault&Millau guide is a very strong message. When it enters a country it means that the country has reached a good level of everything. To be honest, I believe three years ago I wouldn’t have taken the license for Romania. It was too early. We are totally independent, so this is a strong message. There are countries, for instance, in Asia, that pay a guide just to come in the country. Because the message is so strong, for the people. With a guide, we do much more on tourism than any ministries. For some country, it is a strategy to push gastronomy. So, in your view, gastronomy is the engine of tourism. In Romania, we tend to think our beautiful and diverse natural landscapes are our best asset. CC: Well, tourists prefer to have a good experience. What I hear is that when people go to a city, to the sea, they have fun, go to a nice hotel and are visiting nice churches and great museums. And then what happens? They go to the street and look for a nice place to go have drinks and good food. The full experience is here. The memory of your travel is based on emotion. And your emotion comes from great landscapes but that is one experience. But with food, you have wonderful, great emotion twice a day. It’s also good for the economy because you tell them ‘I was there and found a nice small restaurant that I found in the mountains or at the seaside where I had a great time.’ The best countries for tourism, such as Thailand, France or Peru invest a lot in gastronomy. And behind culture, you have the agriculture. And I always like to stress on this combination, because as part of the culture you have agriculture. So the responsibility of the chef is to be aware of the products you have, the terroir you have and how to tell a nice story through food about the landscape and the terroir. In Romania, right now, tradition has met with innovation. Because you need to have tradition. You need to know where you come from, to know your history. But you also need innovation. And you are just at the point of combination between the two of them. And how about the Romanian wines? AA: We’ll have a Gault&Millau wine guide coming out in September. We have that in the countries where it makes sense. And in Romania, it definitely makes sense because Romania is a great country for wines. The interesting thing is that you have a lot of people who have come from abroad, from France or Italy, for instance, and this is good. Doesn’t mean that there is a problem with the Romanian experts, but many of them have forgotten during the collectivisation how to make good wines. In Romania, we have the good terroir, the sun everything is here for making nice wines. CC: The sommelier market is huge and right now everybody is looking for new wines, from new countries. It’s a great opportunity to push the wines and help sommeliers discover Romanian wines all over the world. According to which criteria did you choose the cities included in the Gault&Millau guide for Romania? CC: Well, the first criteria was to go quickly. Normally, we have one guide per year. We launch it usually in November, December. But this year we have two. We have launched one in May 2018 and in November we will launch the 2019 guide. The idea was to move as quick as possible and have the first edition. So we had to make a choice. That’s why we don’t have Constanta, Lasi and Craiova, for instance. It is not complete, but it is the beginning. Then comes the next step. What are the challenges of publishing a printed guide at a time when the internet is the go-to resource for restaurant reviews accessible instantly? CC: Apart from the guide, we have the website and we have the app. So each time something changes, it will be updated almost daily, instantly. Them the user-generated content on our website can be done in collaboration with the restaurant. They cannot change the grade or the text, but they can change the menu and the pictures, price, opening times and so on. It is a way for the restaurant to be there. As for the user-generated content… we just hate the Trip Advisor system because you have fakes. It has been proven that 40 per cent of the reviews are fake. This year, a journalist published a restaurant that does not exist and has become number one in London. Last year it happened in Italy and in France. It is public, you can check it on the internet. Then, when you have everybody giving advice, everybody goes to fast food. The great numbers rules. The more people give advice, the ranking goes down. So we don’t appreciate this way of doing things. Our selection is anonymous, a real selection done by trained people which use rules and a method. And when users make a contribution, they do it with respect. When a user contributes to Gault&Millau, they do it to express their passion, not as a way to punish the restaurant that they didn’t give him or her a glass of champagne for free. I want to share my experience. Where does your revenue come from, given that you do not accept payment from the restaurants featured?